My work attempts to examine how hegemony is communicated and strengthened visually. Recently, I have been working with historical wallpapers, including replicas of 18th century French landscape wallpapers. Landscape wallpapers of this era create an immersive diorama in which the viewer is visually surrounded by illustrations of conquest and colonialism. I have been making maquettes for potential sculptures that would be created from the destruction of the spaces that house these images. One of these wallpapers, Zuber & Cie’s, Vue de l'Amérique du Nord, decorates the Diplomatic Reception Room of the White House. The wallpaper can be divided into five distinct images, each representing a different chapter in the history of the United States, complete with derogatory depictions of Native Americans and African Americans. Some of these images are directly based on historic, racist caricatures. 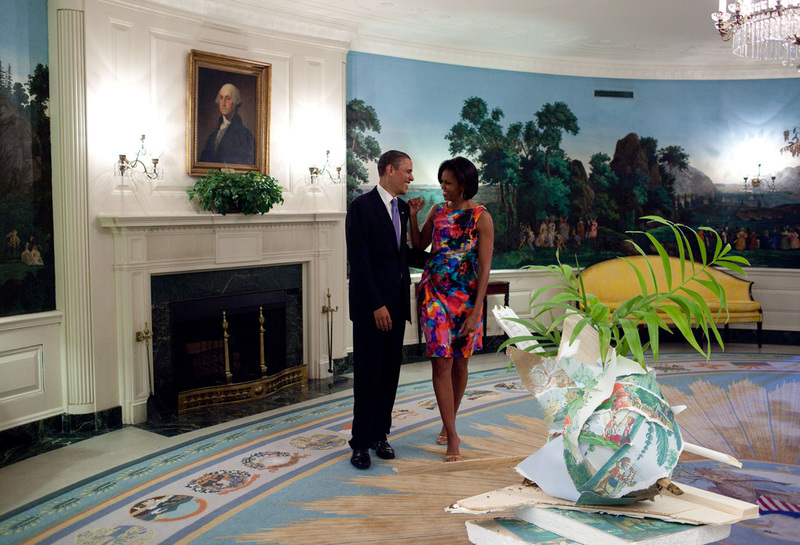 I would like to see my sculptures using Zuber & Cie’s landscape wallpaper exhibited in the White House’s Diplomatic Reception Room in direct response to its walls, and the legacy of colonialist racism inscribed there. Below: Details of the actual Zuber & Cie's Vue de l'Amerique du Nord wallpaper which decorates the Diplomatic Reception Room of the White House. Malisa Humphrey currently lives and works in Los Angeles. Her work has exhibited and screened at the Armory Center for the Arts, the Museum of Contemporary Art, San Diego, the Hammer Museum, the Los Angeles Municipal Art Gallery, the Oakland Museum of California and the Banff Centre for the Arts. She received her BA in Art from the University of California, Berkeley and her MFA from the University of California, San Diego.